eGov AU: Is the Australian Government really slow to update staff to modern web browsers? Is the Australian Government really slow to update staff to modern web browsers? One of the concerns I faced when working in government, and that I know many other people faced as well, was the currency of the web browser(s) available for use by staff. Some agencies still used Microsoft Internet Explorer 6, a ten year old browser that isn't supported by many major websites and online services and that even Microsoft admits is insecure and out-of-date. It is now used by only 0.8% of Australian web users. Others prohibit access to Firefox or Chrome - which, according to some reports, together now hold a larger share of web browsing by Australians than Internet Explorer, and are also considered by many to be more standards compliant. 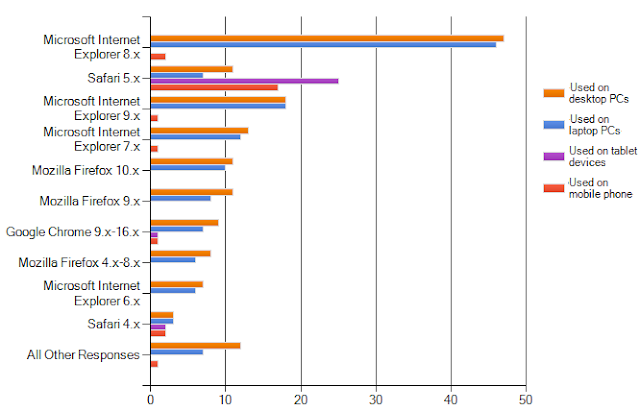 In fact Chrome v21 (at 21.1%) is reportedly the most used web browser by version in Australia, followed by Internet Explorer 9 (19.6%) and Firefox 11 (16%). Why is the selection of browser so important? There's a few reasons that spring to my mind. Because the browser selected can limit the ability of staff at agencies to use the internet productively. To source information, monitor conversations online, use modern web services and even access advanced intranet features. Because it costs more to develop for older, standards non-compliant web browsers - with Internet Explorer 6 compliance often adding 20% to the cost and development time of web sites and intranets. Because it constrains testing of websites. While some web teams have special dispensation to access every browser for test purposes, in other agencies staff are forced to rely on their personal devices, or simply can't test for modern browsers. Because there is an imperative on government to not use software more than two versions old - a particular issue for agencies still using Internet Explorer 6 when the current version is 9. There's also sometimes technical issues. While web browsers are free, upgrading an entire department isn't. There are dependencies - particularly with SAP, which stubbornly only supported Internet Explorer 6 until recent versions. It costs money to upgrade SAP and to manage this and a browser upgrade across thousands of computers, including any communication and training support required. Agencies, with other priorities, may put off this work as long as they can. All this aside - how are Australian Government agencies actually doing in terms of how modern their web browsers are. Are the majority still stuck on Internet Explorer 6 or a similar old and insecure web browser? As part of my FOI request on social media in March, I asked agencies which web browsers they used, as it impacts on which social media tools they can use. Which web browsers are currently mandated and/or supported for use by your agency's staff when using agency supplied IT equipment as specified below? While some agencies may regard this as confidential, please note the web browser type and version can, in most cases, be detected by any website visited by your staff. Aside from two agencies who told me that this was "commercial-in-confidence" information they would not release, most agencies were very willing to provide this information. I've aggregated the results in the chart below based on the 65 legitimate survey responses I received (the easiest information to analyse). Other (non-survey) responses haven't been included due to the analyse time required. for use by their staff - sample from 65 agencies. Looking at this response, many agencies supported multiple web browsers - generally Internet Explorer and one other. Few remained on Internet Explorer 6 or 7, and most sat one version behind the most recent released web browsers - such as on Internet Explorer 8. I did make one error. I forgot to include Blackberry's browser as an option for mobile phones. This is used as standard across all Blackberry mobile devices, so can be considered a standard. So overall, how did Australia Government agencies do? Very well in my view - and better than I had anticipated. While a few agencies (including some very large ones) still lag back on Internet Explorer 6 or 7, most are using acceptably modern web browsers, even providing a choice in many cases - which helps compensate for some of the minor niggles in some browser versions. I note that one of the six agencies reported as still using IE6 has not actually used IE6 for several years. IE6 was ticked in error by the staffer completing the survey. The agency contacted me and it has been addressed. Plus I have a few more responses in there now.